Does the Moon Pull the Water From the Ocean? ← American Airlines Adding Galaxy Tab 10.1 Tablets to First Class! I got up at 4AM today and found the beautiful full moon setting, do they call that “moonset”? Well, that got me thinking about how the ocean tide works and me questioning myself, “does the moon pull water from the ocean?” or is it the other way around? I know moon has some gravitational/magnetic pull on earth but is that strong (stronger than the sun) enough to pull waters? Or the sun doesn’t have much magnetic pull because it’s much farther away from the earth than moon? I decided to do some research so my brain gets smarter. The distance between the moon and the Earth varies from around 356,400 km to 406,700 km at the extreme perigees (closest) and apogees (farthest). An astronomical unit (abbreviated as AU, au, a.u., or ua.) is a unit of length equal to about 149,597,870.7-kilometre (92,955,807.3 mi) or approximately the mean Earth–Sun distance. That means roughly sun’s about 357 times farther away from earth than moon. Okay, call me dumb but it seems like I’ve revisited my quantum physics lessons again, everything in our universe exerts some kind of force on everything else. So, the question still remains, does the moon pull water from the ocean? Yes, the moon does pull water in its direction and that is why we have two high tides and two low tides daily in most places on earth. Above diagram shows what is happening with our tides. Well, if you have anything to add, don’t forget to use our comment box below. One Response to Does the Moon Pull the Water From the Ocean? The earth, and the water of the oceans, which is part of the earth, also pulls on the moon. The dirt and rock, which is what both the continents and the ocean floor is made of, lifts slightly from the pull of the moon. Water is fluid, so it flows toward the part of the oceans that are closest to the moon. Ships rise slightly in addition to the rise of the water as the moon comes over them, both due to the direct effect on the ship and also from the water pushing under the ship. All these effects are so slight, even the rising of the water, as to be nearly unmeasurable. Where we see tides is when the water flows westward due to the moon’s pull, sloshes up onto the coasts and then sloshes back from the coasts. The lifted water also to a small degree flows back eastward when the moon has “moved” on westward around the earth (it’s all relative; the earth is rotating eastward at the same time). The moon actually orbits eastward but as the earth rotates at a much faster angular rate (360 deg/day), the moon which orbits at only 13.2 deg/day, travels westward relative to points on the earth (we’re not thinking of the polar regions). Or the earth rotates eastward relative to the moon, whichever way you prefer to think of it. 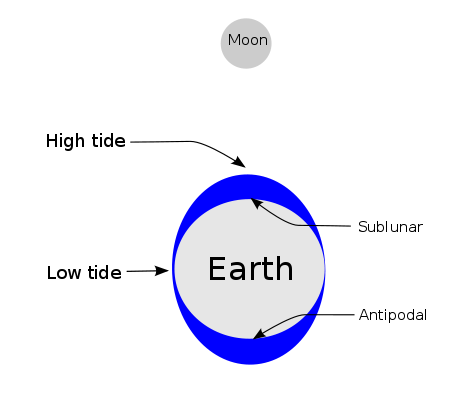 The earth swings around an axis that, relative to the moon, is about 1,100 miles inside of the earth. This is the common orbital axis of the moon around the earth. The earth “sort of” orbits around itself, but it’s not convenient to think of it that way. The earth-moon duo wobbles around the sun, the moon doing most of the orbiting. I think the moon’s pattern relative to the sun is a sort of weaving in and out of the earth’s orbital path. 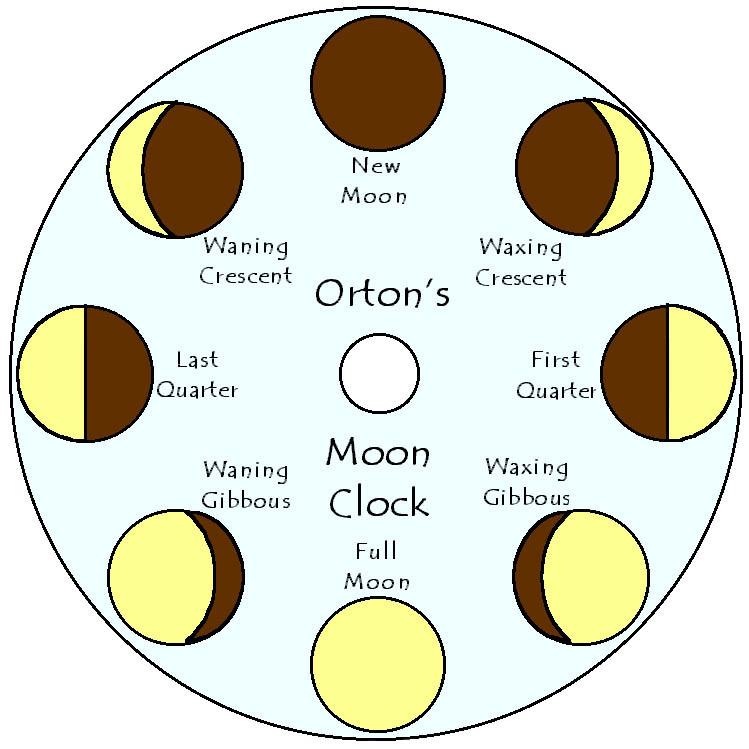 Never have seen a diagram of the pats of the earth and the moon – the earth is always represented as following a near-circle around the sun. The aphelion is about 95 million miles (I’m an antique and con’t think in metric) and the perihelion is about 91 million miles, +/- about 2%. The orbit is nearer a circle than one of the tires on my car. Check out more interesting categories: Science. Forking in the River of Time – Time Travel is Possible! 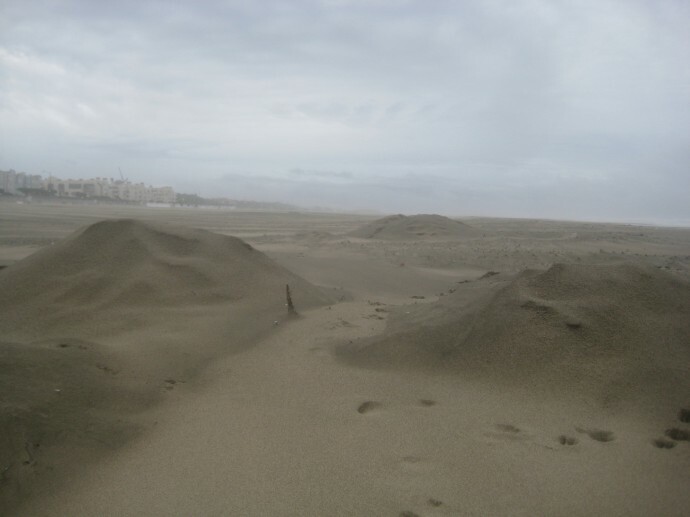 FREE San Francisco Ocean Beach, Sutro, and Golden Gate Bridge Photos! WII Hack – Google Earth interface for Wii remote. Arduino Hack – How to Make a Sonar Distance Twitter Buzzer! Langlee Wave Energy to Power Converter! 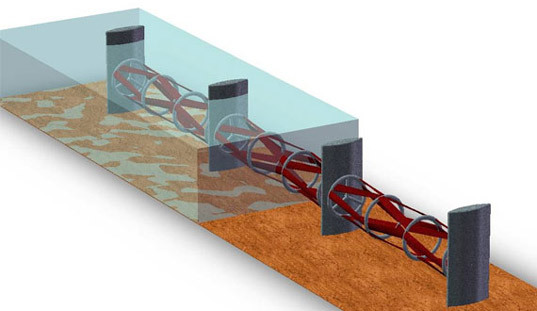 Underwater Turbine for Water Power from Oxford University!